Hang around this little corner of the internet for long, and you’ll quickly learn I love homemade remedies. Now, please hear me out. I’m not a snobby anti-bleach or even anti-Tide woman. 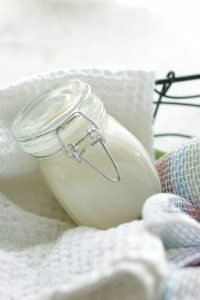 I’m simply a mom on a mission to simplify my home, saying “good-bye” to the expensive (and mostly toxic) store-bought products for effective (and many times cheaper) homemade versions. I’ve loved ditching my store-bought laundry soap for homemade soap that actually works! My homemade body wash brightens my mornings, and the lotion waiting on the counter nourishes my skin, leaving behind a healthy glow. My super-simple astringent has wiped away years of adult-acne troubles. Then, there’s my homemade foundation powder. While sharing homemade beauty recipes, I often mention using oil to wash my face. Truthfully, I never thought anyone would be interested in the idea of a simple, one-ingredient face wash: oil. But, I was wrong. 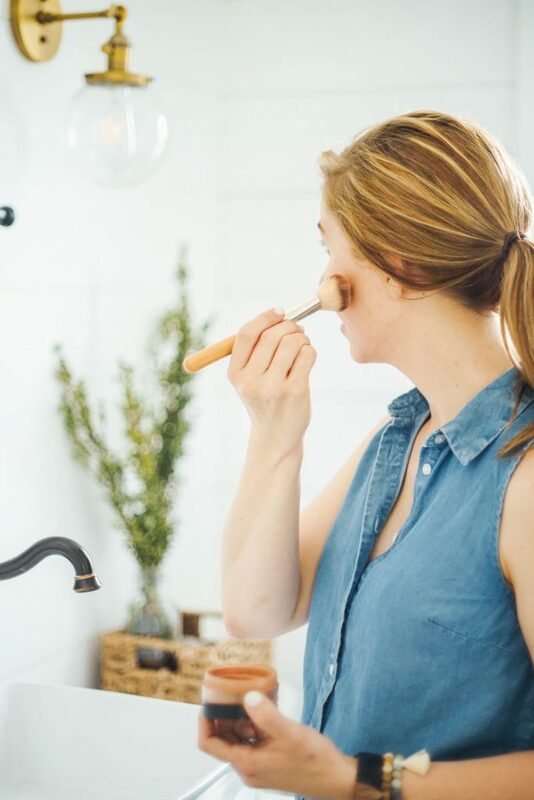 Today, I’m inviting you in my bathroom and sharing how to achieve clean and healthy skin with the oil cleansing method. I understand cleaning your face with oil feels counterintuitive. Trust me, I get it. Using oil is actually one of the most practical methods for cleaning the skin. To keep things as minimally-boring and non-text-book-like as possible, here’s the important fact: oil dissolves oil. Applying oil to the skin washes away dirty (bad) oils and replenishes the beneficial ones. It’s really that simple. I understand cleaning your face with oil feels counterintuitive. Trust me, I get it. 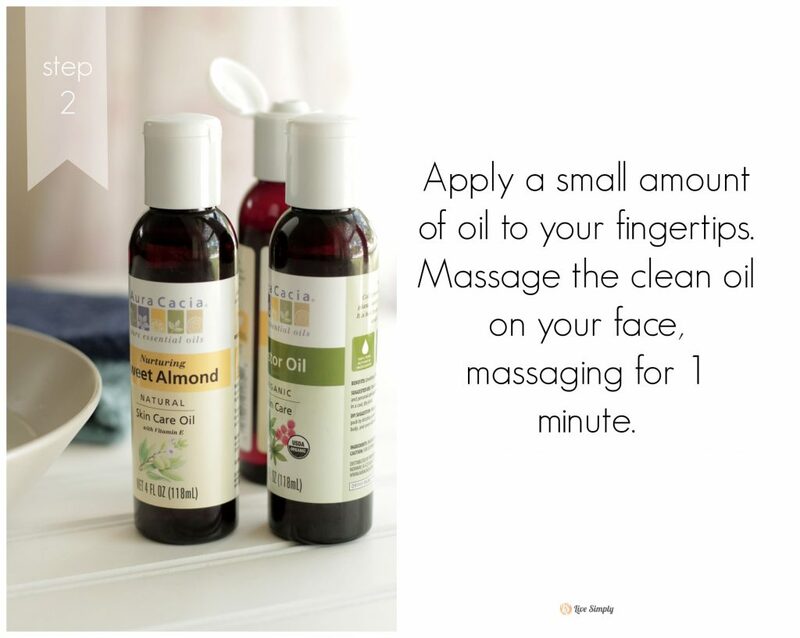 Using oil is actually one of the most practical methods for cleaning the skin. To keep things as minimally-boring and non-text-book-like as possible, here’s the important fact: oil dissolves oil. I've had success using a straight nourishing carrier oil, but tend to switch back and forth between a blend of castor and nourishing carrier oil and straight nourishing carrier oil. Here are a few ratios for creating a blend: oily skin 50% castor oil/ 50% nourishing carrier oil, dry skin 25% castor oil/ 75% nourishing carrier oil, combo skin 30% castor oil/ 70% nourishing carrier oil. 1. During the first couple of weeks you may notice an increase in break-outs. Don’t panic! This is normal. Think of this as a skin “detox,” a cleansing of all the yucky dirt trapped in your precious pores. 2. Experiment with various oils and ratios. I started using straight castor oil a couple of years ago. Bad idea. I quickly switched to sweet almond oil mixed with castor oil. I also experimented with straight sweet almond oil. Today, I use jojoba oil and go back and forth between straight jojoba and a combo of jojoba and castor oil. Enjoy! Your skin will feel great! Great tutorial 🙂 I have oil cleansed for the last couple years and even through pregnancy, post partium/breastfeeding hormone craziness my skin never breaks out! That’s awesome, Renee! I love the great benefits of using oil. I use oil to keep the skin on my face nice, but didn’t know I could clean with it. Can’t wait to do this! What is the purpose of the castor oil? Hey Katie, The castor oil helps to absorb oil, essentially cleaning away the dirty oils on your face. Ah. So are you still cleaning the face if you only use a nourishing oil? Katie, Yes, but the castor is believed to help with better oil absorption. I go back and forth on adding castor oil to my cleaning routine. Both ways (castor/nourishing oil and straight nourishing oil) have worked well for me. It’s really a matter of finding what works best for your skin, which can take some experimenting. Thank you! I love knowing the “why/how”. Should this be done once or twice a day? Hi Emma, I use this method once a day before bed, but it’s safe to practice oil cleansing twice a day. I wash my face with water in the morning and cleanse with oil at night. Update: Week one and my face is feeling amazing! I no longer need to use moisturizer in the AM! Yay! I’m so happy to hear that, Emma! I love cleansing with oil, and look foward to using your recipe. When making a batch for dry skin, you say the ratio is 25% castor oil/75% carrier oil. So, if I wanted to make a cup, I would use 3/4 C carrier, e.g., sweet almond oil, and 1/4 C castor oil — shake and store? Thanks! I love your site. Hey Dorothy, Thank you so much. You’re absolutely correct :). Just shake the bottle and use. I’m just wondering if the brand of castor oil matters. We bought a bottle at the advice of a friend to hurry along our daughters delivery (this “friend” must’ve had a score to settle with me because IT WAS THE WORST BATHROOM EXPERIENCE EVER!!) and there is this entire bottle left over. it’s not the pretty bottle you have above. can I use it for this facial creation? I’d much rather put it on my face than down my gullet. Oh, Esther! I’m laughing so hard. I tried castor oil with my second baby as I was two weeks overdue and had the same experience! 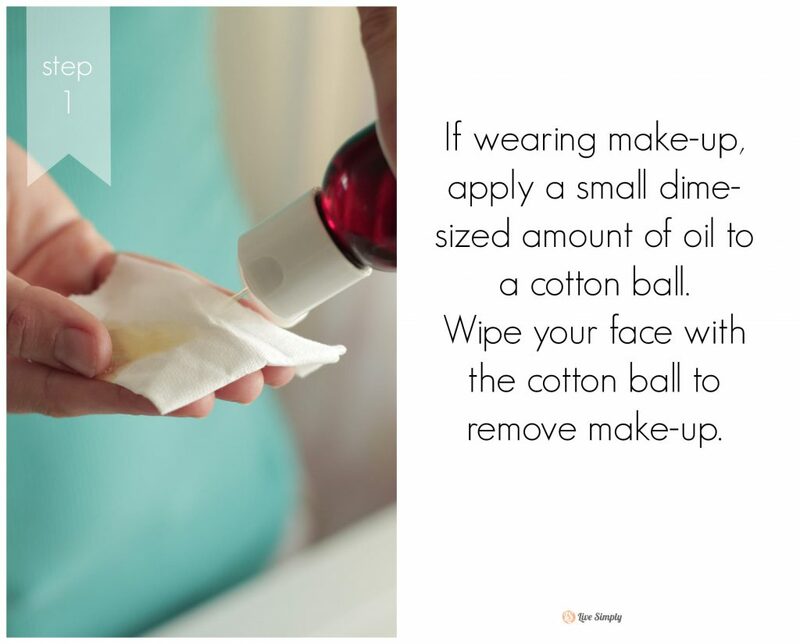 The good news is that oil will work perfectly for washing your face. As long as it’s pure castor oil, you’re all set! Hi there. 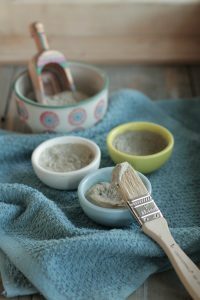 I recently stumbled onto your blog while in pursuit of homemade skin care recipes. I really like you blog and a appreciate the time you have taken to help us readers become healthier. So, anyway, I started the oil cleaning method about three weeks ago after reading your post about it. I really like the concept of this method and I really want to love it in practice as well, but I’m having a hard time. Just to give you a little insight to my skin, it is usually not oily or dry, but I have struggled with adult acne for the last ten years or so. I think my acne might be connected to something in my diet, such as a grain or dairy intolerance but that’s a completely different issue so I digress. Ok, so my problem is since I started the OCM, not only do I have many more blemishes, but my skin is also very tight and dry and I typically do not have dry skin, at least I didn’t with store bought cleaners and moisturizers. Oh and I should mention that I am using hemp seed oil for cleansing and then I apply some as a moisturizer after cleansing. I’ve also used jojoba for both to help with dryness but that seemed worse. Do you think my skin is just detoxing and that’s why I have so many blemishes and such extreme dryness? Or do you think I need to dry a new oil? Any suggestions would be very much appreciated because I don’t want to go back to store bought but I also don’t want gross skin. Thank you. I completely understand. My skin is very much the same way and I’ve also struggled with adult acne. I’ve found the OCM can take a few weeks to really “catch on” (for lack of a better term). If after about three weeks, there’s not an improvement, a different oil combo may be needed or diet might be considered too. Argan oil is very easy on the skin and one that my local natural beauty store often recommends to people struggling with breakouts. Are you mixing the oil with castor? Too much castor oil can dry up oil on the face which can lead to more breakouts and dry skin. Also diet can play a huge role. Adding good fats, like pastured butter, avocados, nuts, pastured eggs (particularly yolks), and homemade bone broth can really help! I also notice a significant difference in my skin when I take regular real food probiotics such as: kombucha, sauerkraut, or kefir. Another option is to try taking a good fish oil, such as cod liver oil, orally. 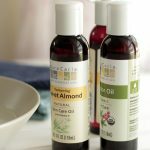 I started out using a little oil each night but my skin was extremely dry so I stopped. I think I’ll wait it out like you suggested before I change my regimen. Hopefully my skin is just funky because of detox. I started a Paleo inspired diet change yesterday so I’m hopeful that will make a difference. One last question, do you know anything about camelina oil? I saw it on MRH and did some reading and supposedly it’s a very good non comedogenic oil. Just curious because until a week ago I had never heard of it. Hey Cherise, Glad to help :). I think you’ll see some nice improvements with the dietary changes too. I’ve never heard of camelina oil. I’ll have to look into it. That’s awesome, Michelle! I’m so glad you found something that worked for you and doesn’t hurt or cause irritation. Lol, it’s a great feeling to know you can eat the products applied to the face ;). Hey Stacy, I completely understand! I created two facial cleansing recipes this year (one uses honey and the other witch hazel). 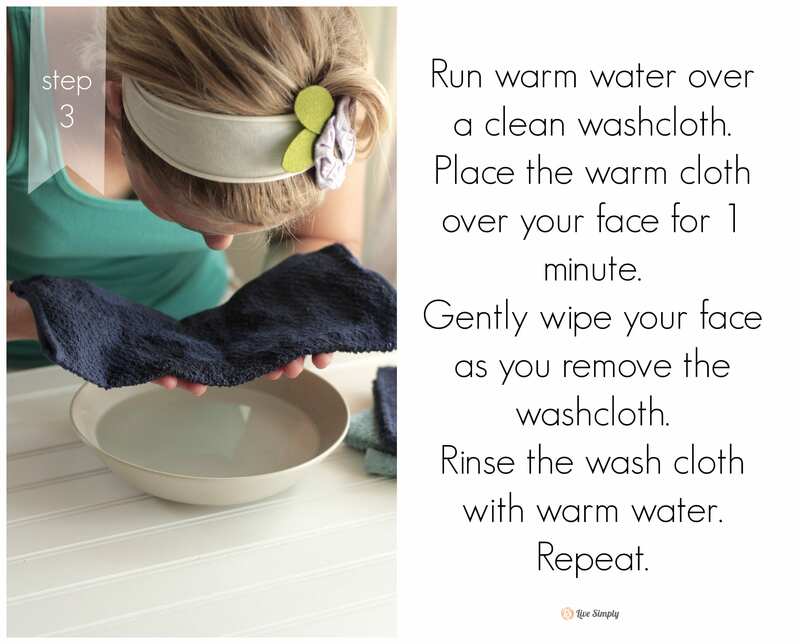 I’ve found the witch hazel wipes remove make-up very well: https://livesimply.me/2015/02/15/diy-homemade-reusable-facial-cleansing-wipes/. And the honey face wash is a great back-up for the nights when I just cant bring myself to oil cleanse: https://livesimply.me/2015/01/31/diy-homemade-honey-face-wash/. Hey Stacey, I’m so glad you liked the mask! I think you’re going to love the face wash (and fall madly in love with castile soap :)). Enjoy!! Thank you so much for all your recipes. I have made the deodorant, bathroom cleaner, glass spray, lip balm and many more- love them! Do you like the oil cleansing method or the honey face wash better? I made the honey face wash and have been using it for a couple weeks… not sure if I should stick it out or switch to the oil cleansing. Any thoughts? Hey Ragan, I’m so glad you’re enjoying the recipes! I go between the oil cleansing method and honey face wash. I keep both in my bathroom. In the morning, I generally use the oil cleansing method (or just rinse with water), at night (since I’m so tired and just want to go to bed) I use the face wash.
Hey Putri, I have both rosehip oil and argan oil, so I wanted to test out this combo on my oily skin before replying to your comment :). Sorry for the delay. Yes, I think both work well together. I mixed a combo of half and half, and really enjoyed using it on my skin in the morning and evening as a moisturizer. I think you could probably use the combo as a cleanser. Another option might be this combo: Cleanse with something simple like 3 TB of aloe vera or juice and 1 TB honey. This ratio would last a few days. Then balance PH with an apple cider toner: https://livesimply.me/2014/04/22/homemade-facial-astringent/. Finally, moisturize with the oils you mentioned, even add something like tea tree oil or lavender to combat the breakouts, or a few drops of frankincense, carrot seed, or geranium for the scarring. Hey Putri, No problem :). I’m sorry to hear you had a bad experience with the face oil product. What was the product called? Essential oils aren’t greasy like olive or jojoba oil, so the greasiness you experienced must have come from the carrier oil. Do you know which oil was the carrier/base oil–jojoba, olive, coconut, rosehip, etc? I would definitely avoid that oil in the future if it doesn’t sit well with your skin. I’m not sure if the same thing will happen again as a moisturizer. With a moisturizer a little bit goes a very long way! Hello. Thank you for the very interesting website. Is tea tree oil safe for my 2 year old child if I add a few drops of it to liquid hand soap please? If yes, how many drops of oil do I add with 500ml soap please? Thank you. Hey Carmen, Yes, tea tree is considered safe around kids. Here’s my favorite site for figuring out how much oil to add: http://www.learningabouteos.com/index.php/2013/08/07/properly-diluting-essential-oils/. Personally, I would add around 15 drops to our soap. Hey Hannah, I think skincare looks different for every person, since we all have different skincare needs. For some people oil cleansing (although an amazing option) may not be suited for their skin. If your skin isn’t loving the oil cleansing method, I recommend trying a cleanser like this aloe and honey cleanser or a soap-based cleanser. I use the Clarisonic Mia (currently) with the honey and aloe cleanser, and love it! I am very excited to try oil cleansing! I have a bit of trouble with adult acne and also dryness in the winter. I have recently started using coconut oil to remove my makeup (not just eye makeup, but for my entire face) and I really love the extra moisture boost. This is why I’ve decided to give oil cleansing a try. I purchased sweet almond and jojoba cleansing oils and castor oil and I’m thinking I will try the mixture you recommend for combination skin to start. I was wondering what sort of routine I should be following with this method? Do I oil cleanse once or twice a day, and do I follow up with the apple cider vinegar toner (to help with acne) and a moisturizer or serum? I know everyone has different needs and it will take some experimentation but I could really use some guidance getting started. Thanks so much for your help and for this wonderful website of knowledge!! Oil cleaning is tricky when it comes to determining a routine that will work best. Many folks claim that oil cleansing eliminates the need for a toner and moisturizer, but from my experience, I really need both of those products while oil cleansing. Personally, I’d try oil cleansing for a few days, and then add a toner or moisturizer if I felt like my skin needed more. I personally like the feel of an oil moisturizer or serum (both are on the blog), since they are such light products. I can’t wait to hear about your experience! Hi. What oil blend do you recommend for mature skin with uneven skin tone/hyper pigmentation and acne scars on cheeks? 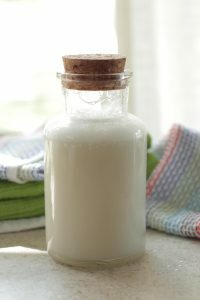 Hey Doris, Wellness Mama provides a few blends in her article based on skin types: http://wellnessmama.com/7569/oil-cleansing-method/. I think you’d probably get the most “bang for your buck” by concentrating on an oil moisturizer like this one (with almond oil): https://livesimply.me/2016/04/15/2-ingredient-aloe-facial-moisturizer/. Hey Ash, I personally haven’t had much success with coconut oil on my face (in recent years). Some people find that their skin loves coconut oil, while others (like me) don’t have a ton of success with coconut oil. 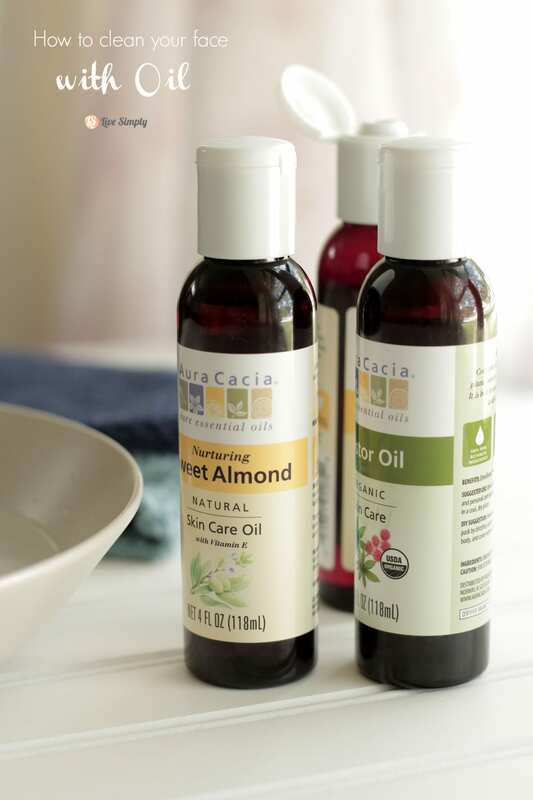 I’m curious, do you actually use the Aura Cacia oils? or is there another brand that you use? I have been trying to find a good quality oil for a reasonable price and have not had much luck. Hey Devon, I use Aura Cacia and Plant Therapy. I really enjoy both brands. I stumbled onto your site looking for a good sugar scrub recipe. When I took a shower yesterday I noticed tons of dead skin in the tub after my shower. Time to sugar scrub my body to get the dead skin off. I love all your recipes & am going to try the green tea sugar scrub. But I did notice in all your recipes you don’t use coconut oil. I have used this, especially on my face to take off makeup. But on my whole body for about 2 yrs. now. I love it!! Also put it in my dogs food because it’s GREAT for their skin & coat as well. My question is, how come you don’t encourage the use of coconut oil as well? I was thinking of replacing the olive oil in your recipe with coconut oil. Is there some health reason why you don’t promote the use coconut oil as well. Or is it another reason? Very curious to hear your response. I will hold off on the oil in the recipe until you respond. As I have both oils I can use either one. Thank you for taking the time to share your knowledge with us. I love coconut oil, and I think it’s a great oil for cooking and body-care. Personally, I’ve found that my skin doesn’t love coconut oil in large amounts, so I pretty much only use it in a few recipes, like my after-shave “lotion” and deodorant. As a cleansing oil or moisturizer, my skin isn’t a big fan of using coconut oil for a prolonged period of time (my skin breakouts and feels really dry). I think this probably has something to do with my European ancestry, since my ancestors were more accustomed to animal fats and such versus something like tropical coconut oil, but that’s just my theory. If your skin tolerates coconut oil, then I’d encourage you to stick with it. Do what works for your skin :). Over the years I’ve discovered, through many comments on the blog, that many people love coconut oil for their skin and use it, and others don’t. I think it’s just a personal preference. You could sub coconut oil for many of the oils called for in my recipes, except if the DIY is a liquid product (like a face wash). Thank you very much for getting back to me so quickly. I ended up making the green tea scrub with the olive oil because after commenting to you. I looked & I don’t have very much coconut oil left. Between giving it to the dog & using it as a skin cleanser. I go through it rather quickly. I also make my own dog treats & they always have coconut oil in them. I don’t know who is more spoiled. My 4 kids & my husband or my dogs. If you ask my family they would definitely say my dogs. But I REALLY digress. Anyway, the green tea scrub with olive oil worked great. The next time I make it I will use coconut oil. Thanks for the recipes. I’ll try some more too. When I have more time. I love your diy skin care.. plez can you tell which diy cleanser and moustrizer can i use for acne brone ??? And which oil is the best ?? Absolutely love your blog! I have a question though. How many times do you cleanse daily? And with what do you follow up with? Could you please post your daily skincare routine? It would be extremely helpful ?